Maryland is one of the smallest American states and one of the most densely populated. However, the "Old Line State" is also the wealthiest in the US, with the highest median household income. Maryland's economy is based mainly on transportation, technical and administrative tasks for the US government, food production, manufacturing, mining and maritime activities. All of this makes Maryland attractive to overseas entrepreneurs wishing to enjoy the advantages of incorporating in the US. As with all USA incorporations, setting up your business in Maryland offers several key financial benefits. Becoming incorporated automatically creates a separation between personal and commercial assets, protecting the business owner’s personal wealth from any debts that the company builds up. This is one of the most powerful reasons for a small business owner to consider becoming incorporated. Secondly, overseas entrepreneurs can benefit greatly from having a US-based bank account. This opens doors to opportunities such as the Amazon Partner Program, which requires all partners to have such an account. This is not easy for a non-US individual to achieve, but there is no such difficulty for Maryland corporations. Finally, becoming incorporated allows more flexibility in taxation than individuals enjoy. The kind of business entity you choose to set up in Maryland determines the nature of the taxes you’ll face. The state requires that C-Corps be charged based on their corporate revenue, and LLCs based on the declared personal income of its members. Depending on your circumstances, your choice can have a major impact on the tax efficiency of your business. Becoming a C Corporation or LLC gives an impression of a much more solid and trustworthy business than a simple sole proprietorship. This can lead to increased sales, and often preferential dealings with suppliers and investors. Also, under Maryland incorporation law, your business must have a unique name distinct from all other entities – this presents a great branding opportunity which Inc. Plan can help you exploit with their free name-finding service. Maryland also makes it simple for overseas entrepreneurs to set up a legal business entity in the state. There are no residency requirements for either owners or directors, although the authorities require that both LLCs and C Corporations name a registered agent who can receive legal and tax documents on behalf of the company. Here at Inc. Plan we offer a service to provide you with such an agent if required, along with assistance with all other documentation and legal aspects of incorporation. In Maryland, all corporation names are required to be be unique. LLC names should end with the terms “Limited Liability Company”, “LLC” or “L.L.C.”. For C Corporations, “Corporation”, “Incorporated” or “Limited” are required, or the equivalent abbreviations. Neither LLCs nor C Corporations can use parentheses in their names. There are also document filing issues to be aware of. When forming a C Corporation in Maryland, a document known as the Articles of Incorporation needs to be filed initially, containing a list of authorized shares and their respective par values. There is also a requirement for a further annual report, known as the Personal Property Report, which is due by April 15th each year. It may sound complicated, but our experience will help guide you through the maze. Taxation is one of the most complex aspects of incorporation, but Inc. Plan can offer expertise on the subject, both before and after incorporation. In Maryland, LLCs will be treated as either partnerships or C Corporations for taxation purposes. Therefore, when classified as partnerships, the LLC will be charged based on its members’ personal revenue. LLCs classified as C-corps will be taxed accordingly, as follows. Domestic C-Corps incorporated in Maryland are taxed at 8.25% of their taxable net income. However, foreign corporations are charged at an 8.25% tax rate based on the property and revenue generated in the state. Additionally, electric, telephone, and gas companies are subject to a franchise tax at a rate of 2% of gross receipts. 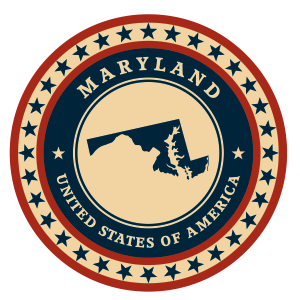 In Maryland, LLC names must be unique and are allowed to end with the terms “Limited Liability Company” or the abbreviations “LLC” and “L.L.C.”. Company names containing a listing of words in parentheses are not permitted in this state. If you decide to start an LLC in Maryland, then the formation document you are required to file is called the Articles of Organization. Additionally, Maryland-based LLCs are required to file an annual report due on April 15th. The annual report is known as Personal Property Report. The name and address of a registered agent which resides in Maryland, and which is available to manage legal and tax business documentation, must be included in the Articles of Organization. In Maryland, it is not mandatory for LLCs to list the names and addresses of its members in the Articles of Organization. For more help with the incorporation filing or for registered agent services contact Inc. Plan (USA). For tax purposes, Maryland LLCs will be taxed either as partnerships or C corporations. Therefore, when classified as partnerships, the LLC’s will be charged based on its members’ personal revenue. LLCs classified as C-corps will be taxed accordingly. The corporation names allowed in Maryland must include the terms “Corporation”, “Incorporated” or “Limited”, along with their abbreviations. Moreover, banking corporations are authorized to use terms like “Banking”, “Bank” or “Bankers”. However, company names containing a listing of words in parentheses, is not permitted in this state. In order to form a corporation in Maryland, entrepreneurs must file a document called Articles of Incorporation and also an annual report called Personal Property Report. This report is due by April 15. The Articles of Incorporation require a listing of the company’s authorized shares, as well as the name and address of a registered agent with a physical Maryland address. Increases in the share stock may affect the initial filing fees. Inc. Plan (USA) can help you with the necessary filings and also with qualified registered agent service. Domestic C-corps incorporated in Maryland are taxed at an 8.25% of the taxable net income. However, foreign corporations are charged at an 8.25% tax rate based on the property and revenue generated in the state. Additionally, electric, telephone, and gas companies are imposed a franchise tax at a 2% rate of gross receipts.